Charming, traditional Sardinian Trattoria - this is a classic neighbourhood Italian serving truly excellent food. 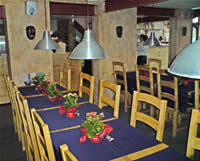 Bar, restaurant, pizzeria and delicatessen (with full menu take away service). Open throughout the day until late. Su Sazzagoni, the Second Deadly sin, is a classic Italian Trattoria, celebrating Italy’s distinctive Sardinian cooking. Since arriving on the scene not so long ago, Su Sazzagoni enjoys a growing reputation for its superb cuisine and has become an integral part of village life in Victoria Park. It’s easy to see why - open throughout the day as well as evenings, Su Sazzagoni boasts a bar, a café and an exquisite Italian delicatessen (with take-away meals available all day). The highlight is the excellent Italian restaurant, serving the finest of Sardinian cuisine, using the freshest possible ingredients. As you would expect, there is a comprehensive Sardinian wine list. Breakfast: Drop by for coffee and a panino or enjoy a full breakfast, Sardinian style. Lunch: Daily, seasonal lunch menu with fixed price lunchtime menu from Monday to Friday. Delicatessen: Open throughout the day, offering salame, prosciutto, Sardinian sausage, cheeses, olives and oils, fresh pasta, authentic Italian pizzas, homemade Italian breads (baked daily on the premises) and many Sardinian specialities prepared on the premises as well as wines from Sardinia. Cooked meals available to take away. Aperitivo: Happy Hour, Italian style from 16.00 - 19.00. Enjoy an early evening aperitivo and sample the delicious complimentary appetizers. Dinner: The dinner menu is seasonal, determined by the freshest available produce and finest quality ingredients. 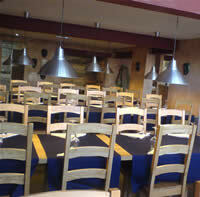 It always includes homemade pasta and ravioli, home-made pizzas, rice, soups, meat, fish, vegetables and desserts. The famous ‘Gelato di Ariela’ ice-cream, handmade from an ancient recipe, is a must. Every Tuesday and Friday from 6pm and on Sunday's from 1pm, you can enjoy live acoustic music, creating a very relaxing atmosphere while you dine. Cena Agrituristica - weekdays, enjoy this 10 course set menu, in typical Italian style, a wonderful culinary experience. Sunday Lunch - Su Sazzagoni offers lunch every Sunday. 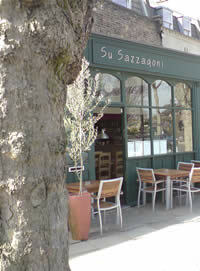 Su Sazzagoni is now licensed until 11pm every night of the week - including Sundays. Celebration cakes and pastries: Surprise your guests on that special occasion – Su Sazzagoni is renowned for its cakes and pastries – which can be made to order. Catering for special events: Su Sazzagoni caters for small wedding parties, birthdays and corporate dinners – for parties of up to a maximum of 50. Please email us for details.